DOLAR Exchange Traded Fund tracks the performance of USD/TRY exchange rate.Investors can buy and sell the fund on Borsa Istanbul immediately without having to wait extra days for settlement. In particular, mutual funds & pension funds in Turkey cannot invest in USD Dollar as a money market instrument but can invest in US Dollar as a capital market instrument easily & with a low spread through the exchange traded fund. DOLAR Exchange Traded Fund tracks Finans Asset Management American Dollar Foreign Exchange Traded Fund Index. DOLAR Exchange Traded Fund is listed on Borsa Istanbul and can be traded through any broker with access to the exchange. Retail investors can buy & sell the fund through online or telephone banking. Investors can trade the US Dollar in a single transaction through any brokerage house. 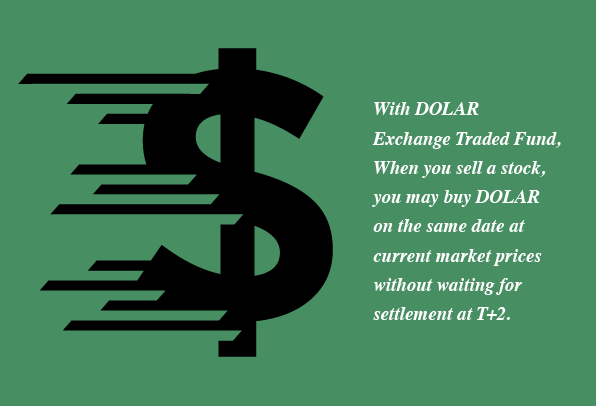 DOLAR Exchange Traded Fund eliminates costs and can be traded with a narrow spread. Management fees are low for exchange traded funds. DOLAR Exchange Traded Fund management fee is only 0.37% annually. ETFs are priced based on their Net Asset Value, investors can follow the price continuously during trading hours.